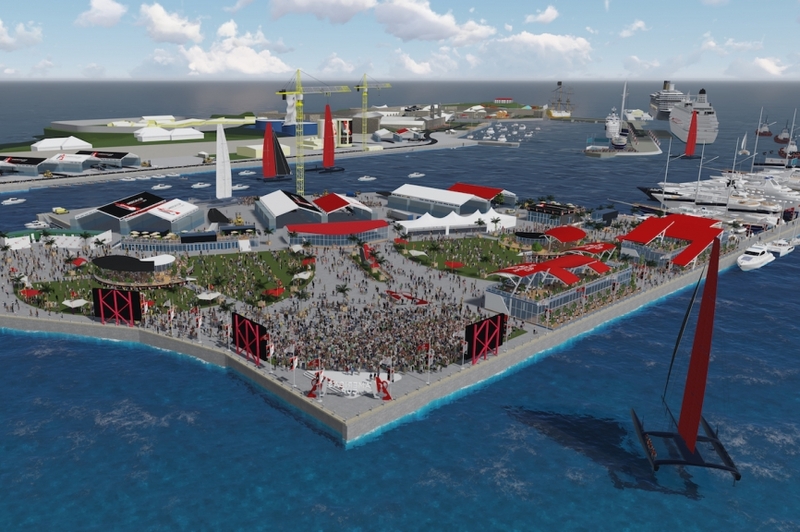 [Updated] Dockyard was selected as the venue to base the 2017 America’s Cup, and a purpose-built event village will be developed, the organisers said today. Ending months of speculation, the America’s Cup Event Authority revealed in a press conference today [Dec 2] that Bermuda has been selected to host the America’s Cup in 2017. The statement said, “The Royal Naval Dockyard, with its magnificent setting and rich maritime history, was selected as the venue to base the 2017 America’s Cup. “A purpose-built event village will be developed in the South Basin of Dockyard, offering an unparalleled viewing experience, along with infrastructure to support and service the sailing teams and spectators. “All developments associated with the America’s Cup will be designed to be sustainable and in the best long-term interests of Bermuda and Bermudians. Six teams have so far taken up the challenge of racing for the next America’s Cup, the oldest trophy in international sport. The defending champion is Oracle Team USA, which won the last event with a spectacular comeback over Emirates Team New Zealand, who return as a challenger, along with Artemis Racing from Sweden, Ben Ainslie Racing from England, Luna Rossa Challenge from Italy and Team France. Racing in Bermuda will be an incredible experience for the spectators, both on-site and for those watching the broadcast, and for the sailors, it’s going to be very challenging,” said Oracle Team USA skipper, Jimmy Spithill. In 2017, all teams will compete in their new AC62 catamarans, powered by highly-efficient wingsails and designed to fly above the water on foils at speeds near 50 mph. Wonder how that may tie in with WEDCO’s plans for the West End? Certainly the AC Committee and Wedco should get around the table post-haste. Definitely a great idea. One question is ‘” How will the event village be used after the Amercica’s Cup? We need to avoid developing the typical white elephant that is mostly unused (like several Olympic villages) after the event. A few years ago they planned to reclaim land and move Marine and Ports and the Boatyard to that same location. My opinion is that once the Americas Cup is over they might move M&P and the boatyard over to create more retail stores. Hopefully it is a Win Win situation since now they might have money injected from the race to build it instead of trying to build it from Wedco’s pocket. Only disadvantage I see is it gets quite rough in there when the wind is from the east. Waves bounce back and forth between the walls since there is no where for them to go and in hurricanes it gets swamped. So i hope they build it high enough to allow for it in bad weather. Glad we got the Americas Cup now we all have to work hard to make it a big success. be a big big issue in the House between both political Parties. Kudos to the Government for pursuing this successfully amidst intense competition!! Congratulations are in order for those who worked hard to make this happen !! Indeed. I hope there are plans to make the causeway look presentable. Yes, that as well would / must be done: “The journey of thousand miles begins with the first step” and that has been made, now lets get busy everyone by improving the Islands appearance starting with L.F. Wade International Airport and Causeway, (all the way from Baileys Bay to Dockyard must be “buffed-up”) So now is a time to utilize prison labour and them claiming they can’t find work and are sucking off of the Govt./ Taxpayers for a monthly check. Put them to work also! So how much will this cost Bermuda? What is the expected return on investment? These are the details that I need to hear before I can celebrate. By comparison, can anyone in govt demonstrate how much money was generated from the PGA and what we can expect by comparison with this event? Thanks. Comparing the Grand slam to the America’s cup is like comparing the Island games to the Olympics. Really? So we will host the America’s Cup for the next 8 years +? mixitup, The return on the Grand Slam was negative. Do you think that the Grand Slam ever benefited us enough to offset the monies spent on Port Royal? And if the Grand Slam is really all that popular why were they giving out boatloads of free tickets so that the spectator gallery wouldn’t look empty? But MD does ask a valid question. How much is this going to cost? What Mr. Davis is saying is that most golfers have never heard of the Grand Slam of Golf, let alone the general public, it is not an important event. The America’s Cup is known by everyone who sails and a lot of people that have never even been on a boat. They are completely different events. To compare it to golf it would be like the U.S. open being played here, now that would get some attention! You and others are missing the main points here…..So how much will this cost Bermuda? What is the expected return on investment? The PGA comment was just that, a comment. I wasn’t meant to be the focus of MD’s post. We all need to focus on the main point or else we create a conversation that has no means. I agree. I was simply trying to help mixitup see it was not a great comparison, which a lot of people have been making btw. St. George harbour is not big enough to accommodate the size and potential speed of these boats. what about racing from Dockyard to St.Georges in the north shore channel? does the route have to be circular? I think you need to do a little search for information on exactly what the Americans Cup is. Dockyard to St Geo or vice versa is too long of a course and very unchallenging. And the race being cricular as you mentioned is that way for a reason. The turning of these large boats are a crucial part of the race as it demonstrates the crews knowledge of sailing. A straight race would not highlight a crews skills. The whole concept of a sailing race is that you sail in more than one direction so that you have to tack. The only sailing race I have EVER heard of that does not follow this, is our own Comet Race. Great though that race is, it does not follow common sail competition procedures. agreed. We should prepare St Geo and offer that as another venue for the next AC. One year Dockyard, the next time St. George’s…we need to dream big. St. Georges should update their stores, etc. but so glad the Dockyard was chosen. St. Georges is too beautiful to have new modern facilities built. Oops, there I go again… it will be built by work permit holders! What was I thinking?!?!? **** you are an *** !!! And the event is foreign. Horror of horrors. And the money is foreign. And those that fly in are foreign. This is an INTERNATIONAL event. It’s going to need international standards and speed. It’s not just about making Bermudians rich. Is that a barge or are they “reclaiming” the acreage? This is a game changer for this great country!!! Must take full advantage of the opportunities to show the world how truly great we are as a people, island, and host for the world to see! Not really. Shallow water in that corner. Exactly!! Not difficult to achieve……..
No money for scholarships for children, but watch how fast dunkley and richards start hemorrhaging money now. and with your attitude we can just kiss it all away. This investment will bring in money for even more and more scholarships you dummy. Beyonce took money away from our children! SO did Port royal ect ect. Yeah, well you said it would never happen, Robert. We Bermudians should be so proud that the world cup is coming to Bermuda !!!!!! !thank you OBA, we should be so proud….and we are also thankful for all of the new hotel developers that are going to invest money in this beautiful Island….we are moving forward at last…. and else for you negative people we have enough of your sour grapes …. The World Cup is coming to Bermuda?? When?? Amazing how the OBA is really dotting Bermuda on the Global map. Unlike the PLP, who brings beyonce and pay her a million dollars for a one hour concert. OBA needs to keep doing what they are doing. OBA rocks, wasn’t a fan of them. Also, if the PLP didn’t play the race card they would never be back in Power. But we all know that’s what they do, just like the republicans in America they use the religion win elections. So we have a bunch of eggs … Let’s wait for the chickens ! So waiting was your PLP plan. How was the speech giving. What feedback did you get? Congratulations Team Bermuda and in particular the event organizing committee. Let’s hope the entire island and all stakeholders including the private sector, IB, the unions, sporting clubs and countless other organizations will rally together and put any differences aside to show the rest of the planet we can host a world class event offering superb hospitality and a wonderful time for visitors who will return time and time again to experience all we have to offer! Dockyard is the wrong place,St.George#s would have the ideal location! I put this on another post but it also works here. Just read the revenue stats when AC34 was in San Fran. Very encouraging. Hope AC35 in Bermuda produces the same and the playing field is leveled, the tendering processes are transparent and all Bermudians benefit not just a chosen few and that Bdian workers come first and are given first preference in all job categories. 2017 is a politically strategic year interestingly enough. Congrats to the Govt for pulling this off. I’ll still be watching though. Let the games begin! This will be a shot in the arm for Bermuda’s economic health. Very bold plans. I’m excited for Bermuda as a whole. Don’t get too exited about those big fast sailing boats you saw in the last America’s Cup they won’t be coming here as they are too fast and expensive – we will be back to the mono hull boats we are normally seeing! No-one can afford to challenge with those cats!!! That’s exactly what’s coming here in 2017. They are supposed to be sailing AC62 foiling catamarans for this upcoming AC challenge in 2017. So yes we will be seeing fast, foiling catamarans for the races. Don’t think that you would last very long in a comedic career. Please explain or are you just making that up. They are going to be using the slightly smaller version of the ones they used in the last America’s Cup. Well done organizing committee. Dare to dream big and sometimes you’ll succeed. Bermuda is an incredible island. Now we simply need to get behind our country. We need to claw our way out of this financial cesspit that we have found ourselves in after years of mismanagement. What a shame that we all allowed it to happen. Now, get involved, be positive and lets work together. Our country is at stake. Support this effort with everything you have got. The planned Event Village looks fabulous and just goes to show how much time and effort has already gone into preparing Bermuda’s bid for hosting one of the greatest sporting events in the World. We did not win this bid by sitting on our backsides and spouting PR rhetoric. Bermuda’s bid was clearly very well thought out and has resulted in us being chosen as the venue over a host of other cities who were keen to do what we have just accomplished. Congratulations to all concerned. Just one suggestion. There will be many in Bermuda who are not familar at all with the America’s Cup and we need to not only sell ourselves abroad, but we need to make sure that everyone in Bermuda gets on board and feels that they will benefit from the hosting an event that should provide a phenomenal boost to both tourism and international business. minimal economic impact likely. Major sporting events in general do not produce much if anything economically. You will be proven absolutely wrong. Well done Bermuda Government! This is a huge boost and will encourage investment by the private sector. It is not the answer to all economic problems but iit is a huge boost in the arm that we must celebrate! By the way I think the PGA was also excellent and I enjoyed the Beyoncé concert. No one event is going to solve the problem but putting Bermuda on the map as each did was beneficial. Let’s celebrate Bermuda in Unity! Beyonce did nothing for us on the international map ! PGA Grand Slam….I’d never heard of it before, was it on the TV anywhere? Gigantic Coup for Bermuda…go big or go home…..we needed a game changer to get Bermuda moving again…people will complain that it should be here or there or whatever but the fact of the matter is that it will create jobs and bring in foreign investment….new hotels, casinos, marina’s for international yacht’s to make Bermuda a regular port of call…positive thinking only…….. This is potentially great news…potentially only if the average man in the street can see indirect benefits as in jobs. What will be great is if the OBA will begin immediately to identify the unemployed and employable and scout out jobs for them before those who bid on jobs start getting their foreign workers to come in and enjoy our economic pie again. There should be a criteria for participation and that criteria should show evidence of the companies attempts to help our people and our economic problems by bermudianisation and long term development of people. This will shut the nay-sayers up. Grant Gibbons should be applauded for his diligence and this tremendous accomplishment. I want to see the trickle down economic development become pull up economic development. If you’re unemployed and have a construction background, you should be banging down doors to get a piece of this action. Im glad the govt was able to do this, but Really, you cut scholarship money, you cut seniors, and the list goes on. 2017 you will go out with a bang when the election comes around. How many foreign workers will be brought in for this event. those foreign workers all need a place to live, will eat from the smaller less expensive mom & pop restaurants/lunch carts, will pay payroll taxes, will buy a bike, have that bike serviced, buy gas, buy clothes contribute to charities (or those archaic compulsory union dues)…. the list goes on! so if you’re not on board with this effort, then you’re against it and the betterment of Bermuda and her people. @ watching you…the PLP spent all the money if you haven’t got money to spend then how can you spend it? Note: although scholarships were cut marginally in total, the total awarded to an individual was reduced, so that MORE students got access to scholarships…Few v More .none seems to compliment the govt on benefiting more with less, despite it being a PLP slogan. Are you serious? Why don’t you give the OBA a break! Did the PLP do ANYTHING LIKE THIS FOR BERMUDA? Oh heck no they did not. I think that Bermudians of all walks of life will benefit by finding jobs and also these people will have to stay somewhere and eat somewhere won’t they? The PLP over-spent on everything they did, don’t you get it yet? I just hope someone and his crew aren’t involved … it’d probably only last for the event. then fall into the Sound. we all hope and pray this will help us as a collective group of Bermudians ! hopefully the rich wont get too rich and fill both pockets with our money this time ,weve had too many booboos , but my question is this are we going to fix that run down airport first because honestly it looks like crap !!!!!!!!!! If the opposition want to regain a foothold in the self respect department they should work along with the ruling party to assist Bermuda……BERMUDA. I guess Mike D and the Greens new something we are all finding out later….smile.